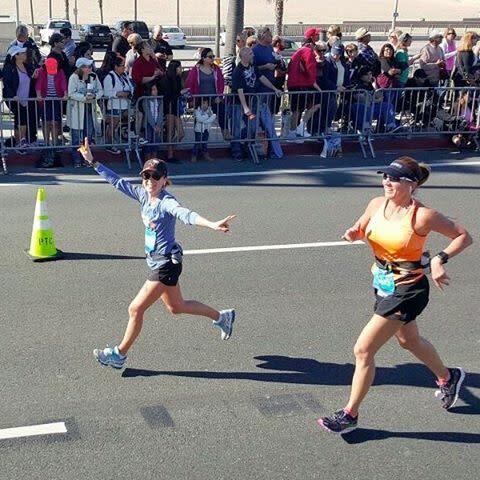 The annual Surf City USA Marathon is more than a race; it’s an attraction that draws thousands of people to Huntington Beach on Super Bowl weekend. 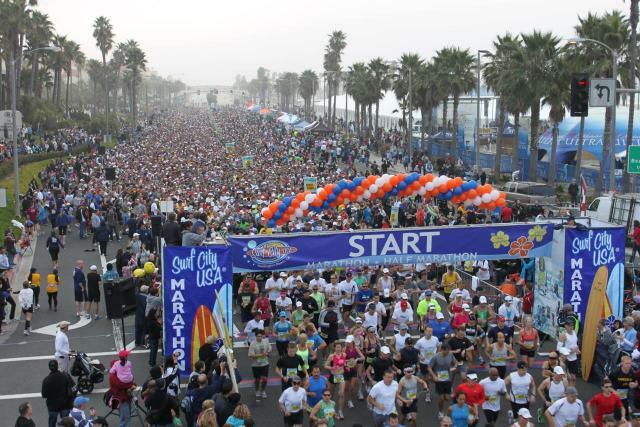 On Sunday, February 5, more than 2,500 runners will meet at 6 a.m. at the Pacific Coast Highway by the Huntington Beach Pier for the start of the Surf City USA Marathon. The first wave of the Half Marathon begins on Sunday at 7:45 a.m. and attracts almost 30,000 participants. In addition, racers can experience the Virtual Run Option, a new event this year wherein they are required to complete a virtual 13.1 mile half marathon or 26.2 mile full marathon. Click on www.runsurfcity.com for registration and details. 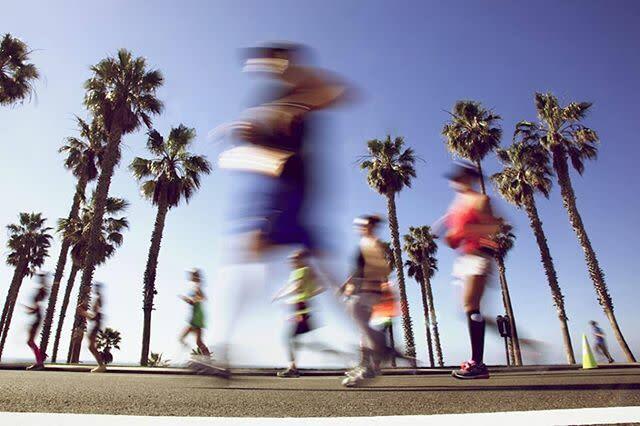 For competitors and spectators, there is plenty to do before and after the marathon from bonfires to biking, relaxing on the sand and enjoying all that Huntington Beach has to offer. 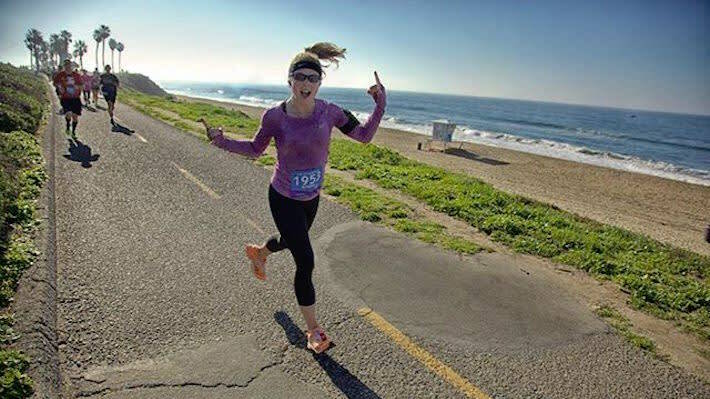 Kickstart the weekend by stopping in at the Active Lifestyle Expo, located in the Huntington Beach Parking Lot, 21291 Pacific Coast Highway between Beach Blvd. and Huntington Street. Check out the local vendors, try the free samples and shop the latest in run technology, nutrition and fitness. Hours will be Friday: 1-7 p.m., Saturday: 9 a.m. - 5 p.m. and Sunday: 6 a.m. - noon at the Finish Line Festival. 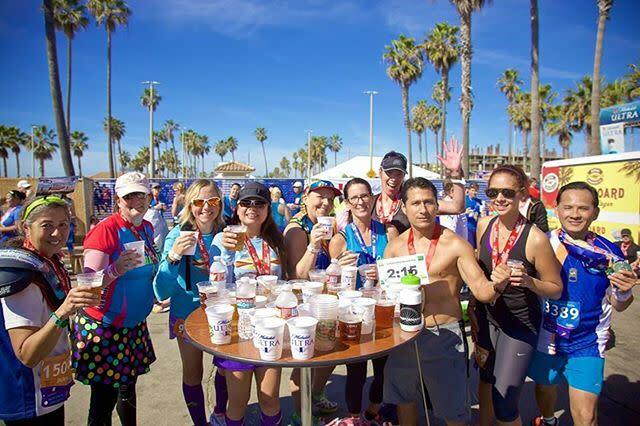 Come on in and have a cold one with the Sam Adams crew at the Beach Party Beer Garden in the finish area next to the Pacific Coast Highway. Your race bib and I.D. are good for a couple of freebies. Limit two beers per participant. Hours: Friday and Saturday: 11 a.m. - 6 p.m., Sunday: 9 a.m. - 1 p.m. (runners over 21 only). Hit up any of the hotels, restaurants and/or bars within walking distance along Pacific Coast Highway or Main Street to celebrate the race and watch the Super Bowl. The establishments are always welcoming to runners and guests. Many offer race weekend specials. One popular gathering place is the Waterfront Beach Resort. Serving as the host hotel for the Surf City USA Marathon, this Hilton hotel is directly across the street from the start of the race. Good eats and treats specials will be served all weekend. Saturday – Waterfront Beach Resort’s bar/eatery Shades Restaurant will have a regular dinner menu, as well as two bottomless (all you can eat) pasta dishes/specials. This is a great choice for runners looking to load up on carbs before the race. Reservations are highly recommended. 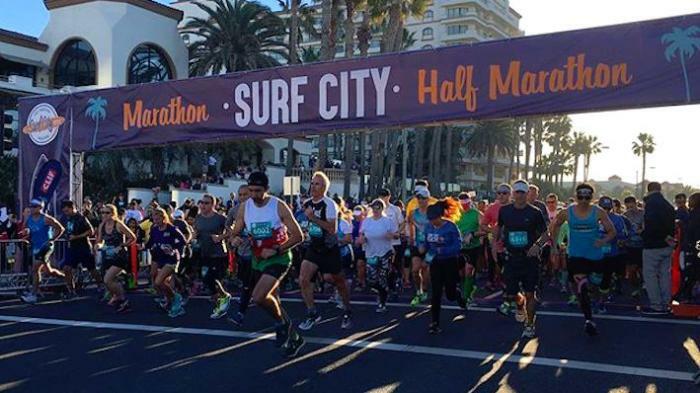 Sunday – Surf Hero Market, Waterfront Beach Resort’s casual poolside dining option, and Shades Restaurant will open at 5 a.m. to accommodate early runners. 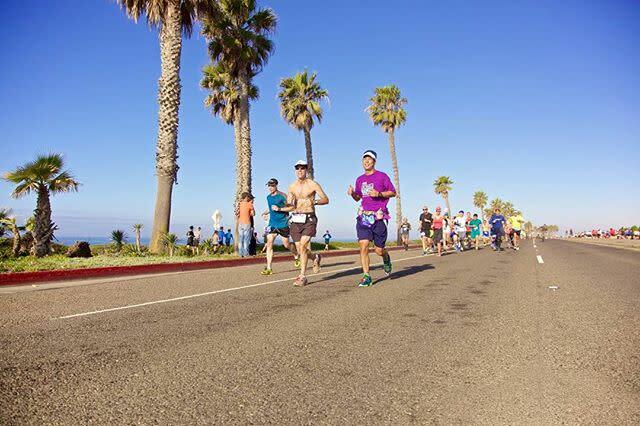 Runners who show their race medal will receive 20% off their total bill at the Surf Hero Market from 10 a.m. - 9 p.m. In addition, the Super Sunday BBQ in Shades Restaurant will be served from 11 a.m. to 3 p.m. Guests can also watch the Super Bowl on one of two 40” LCD TVs at Shades Bar and take advantage of the Runner Happy Hour Specials from 2-7 p.m. There are many eateries and bars in Downtown Huntington Beach and within driving distance that invite you to have fun and view the big game with them. 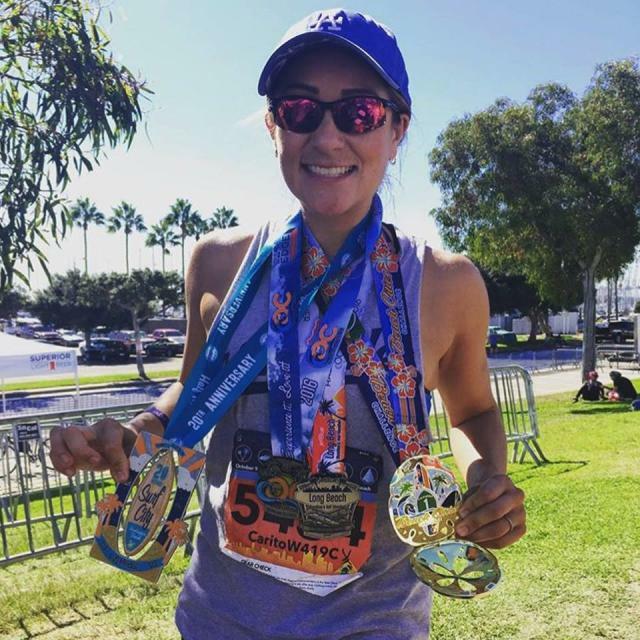 Here are a few that tout discounts and prizes for those who bring their medals or race bibs: BJ&apos;s Restaurant, Eureka!, and Lazy Dog Restaurant. To reduce the hassle of parking, the following info will help make the weekend stress-free and ticket-free. *There will be no event parking at the Beach Promenade shopping center located at the intersection of Beach Blvd. and Atlanta Avenue. Vehicles will be towed. The City of Huntington Beach has several parking lots. Rates for these lots are $15. Please bring exact change. NOTE: The state beach lots are NOT free on Friday and Saturday for the Expo, ONLY on race day. The cost of these lots are $6.50 for the first two hours and an additional $2 for each hour after. Pacific City (located directly across from the site) will be offering underground garage parking. Cost: TBD, 1,000 spaces. In the event that designated parking areas for participants are full, there will be overflow parking available at the following locations with shuttle service before and after the race. Edison High School: located at the corner of Magnolia and Hamilton. Hoag Health: located at the corner of Beach Blvd. and Adams Avenue. Ride the FREE shuttle service from most of the parking lots indicated on the map (link) including Overflow Parking. Shuttles are round-trip. Expo Shuttle: There will be an Expo shuttle that will operate from the state beach parking lots from 2:30 pm. - 7:30 p.m. on Friday and from 8:30 a.m. - 5:30 p.m. on Saturday. Race Day Shuttle: Shuttle service will start at 5 a.m. on race day and will service all lots until 1:30 p.m. Shuttles will arrive at 10 minute intervals. All shuttles will return riders to the same location that they were picked up at. The Waterfront Beach Resort is also offering complimentary shuttle service to Pacific City and the downtown shopping and dining district to their guests at the top of every hour.